Join a full-day Sonoma Valley wine tasting tour and visit some of Sonoma’s finest wineries with a knowledgeable guide. You’ll learn about the winemaking process at three boutique wineries, stopping at the Golden Gate Bridge for magnificent views along the way. Enjoy a picnic lunch next to vineyards before free time in Sonoma’s historic Spanish-style plaza, where you may shop, visit a tasting room or get some ice cream. Round-trip hotel transport by mini-bus with narration on San Francisco history is included. Numbers are limited to 14 to ensure a personalized experience on this small-group tour. 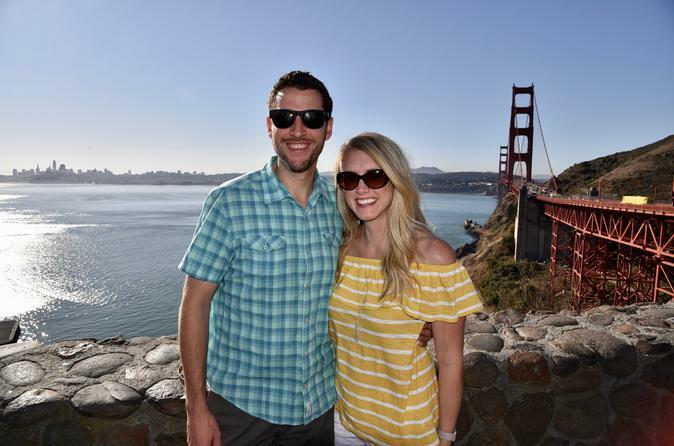 Your full-day wine tasting tour starts with pickup at your hotel in San Francisco and then heads north with a photo stop at the Golden Gate Bridge, where you can enjoy the views of the bay and the Marin Headlands. Relax on the mini-bus with onboard narration about San Francisco’s fascinating history and neighborhoods. Bottled water is provided for the duration of the tour. Throughout the day, you’ll learn about the area and its vineyards from your informative guide, and receive a detailed explanation about the wine-making process. At Larson Family Winery, located in the heart of Sonoma Valley, enjoy a picnic with a box lunch full of goodies like a deli sandwich, side salad, cookie and bottled water. Wine is available for purchase by the bottle at the winery if you wish to enjoy some with lunch. In the middle of the tour, enjoy a one-hour visit to Sonoma’s downtown, where restaurants and specialty shops border a charming historic plaza. There are chocolate and cheese tastings available if you like. Afterward, board the mini-bus for the return trip to your San Francisco hotel, ready to impress your friends with your newfound love of Sonoma Valley wines.